This section is not a guide on building artificial ponds but a brief overview. For more in-depth topics on basking, filtration and water quality, please refer to their own sections. Further research and reading is recommended and qualified professional help should be consulted prior to and during any major pond development. Keeping a RES outdoors offers a greater range of opportunities to create a more natural environment. It may be a more satisfying experience to observe your turtles as they would behave in the wild. Watching your RES with legs and neck stretched out basking in the sun would make the effort worthwhile. Expect the initial start-up costs to be greater than an indoor tank and this will require added effort and creativity. You will also have to commit a fairly reasonable amount of space to build this habitat. A complete functioning outdoor pond will require less maintenance overall and can house more adequate nesting and basking areas. Costly UV bulbs will be replaced by unfiltered sunlight and there should be greater areas for your RES to explore and swim around. Water filtration will still be an important facet of your turtle’s care and a water heater is recommended as well. Your RES should be in good health when introduced into a pond while hatchlings should be raised indoors until they are strong swimmers and adaptive hunters. The materials used in the foundation of custom ponds vary. 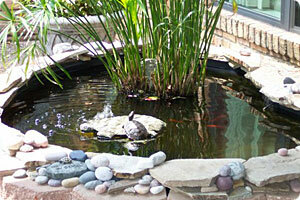 Outdoor ponds can be made from preformed shapes, pond liner, poured concrete and durable containers such as stock tanks. 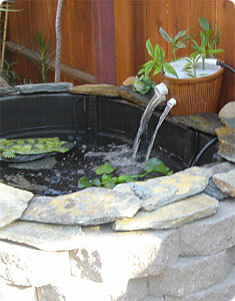 The amount of effort, expense and time will vary with each individual pond. Stock tanks and preformed ponds could also be partially in-ground or completely above ground. Since there will probably not be any future upgrades, a habitat that is 120 gallons may be suitable for one adult female and 200 gallons for 2 adult sliders. It is important never to overcrowd an environment because that would lead to aggression, harassment, injuries and increased waste load. Here are some of the positive and negative aspects of having an outdoor habitat for your turtle.